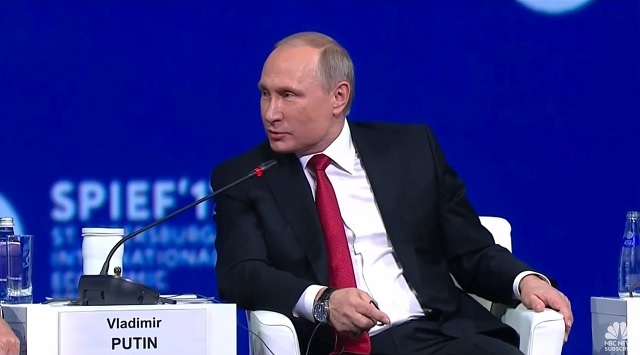 Russian President Vladimir Putin told Megyn Kelly at the St Petersburg International Economic Forum on Friday that the US intelligence community has produced "no specific evidence" and "no facts" to prove Russia hacked the election. "I read those [US intelligence] reports," he said. "Even in those reports, there is no specific evidence, no facts. Just assumptions, allegations, and conclusions based on allegations. Nothing more. If there is something specific, concrete, we could discuss that." Putin went on to point out how the US is constantly meddling in Russia's affairs and interfering in their politics. "Look at your colleagues, what they are doing here," he said to Megyn Kelly. "They are all over our domestic policy, they're sitting on our head, dangling their feet and chewing a bubble gum. Entertaining themselves." "It's a systematic, rude and absolutely unceremonious interference in our domestic policies that lasts for many years, also at a diplomatic level," Putin said.